Through several initiatives the OFC has become the leader in Manitoba for the proficient response to incidents involvilng hazardous materials, wildland urban interface fires, GSAR, USAR and incident command/managmenent of major provincial/municipal emergencies. 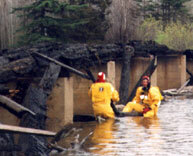 The Office of the Fire Commissioner developed the Critical Incident Stress Management Network for Emergency Response personnel in Manitoba. The Office maintains and supports this Network. This network of trained peers provides Critical Incident Stress defusing as well as debriefings to emergency response personnel within the Province.